So to go along with my exercise kick I have been trying to eat a little healthier. True, I have not made many big changes yet but I am really trying to eat less sugar. 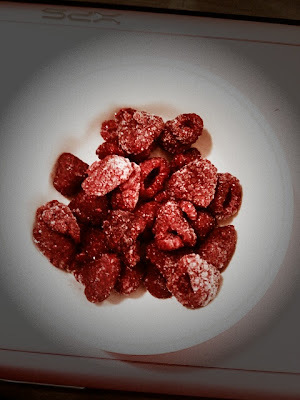 Recently I have found that the best way to satisfy my sweet tooth is to eat frozen fruit. My all time favorite new dessert is frozen raspberries. Delicious!